On Monday, we announced our March Qualification Grant finalists. Today, we’re thrilled to introduce our winner, Lauryn Dempsey, Co-Founder/CEO of Norma. Norma’s mission is to empower women to take charge of their breast health. How are they doing so? And how can you get involved? Read our interview below and view their quick video to find out. WN: Share with our readers some background on yourself and the genesis of Norma. LD: To say Norma came out of nowhere is an understatement. Seven weeks ago, only two of the six women who co-founded Norma even knew each other. 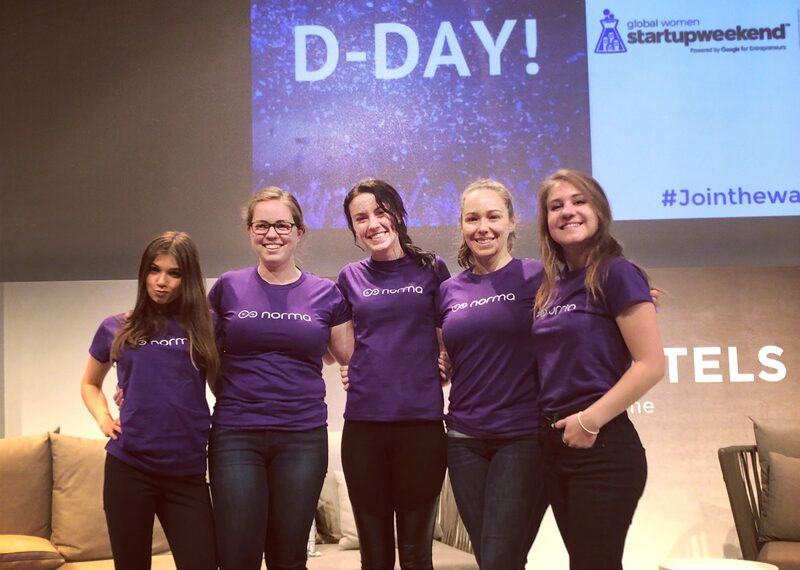 Our team formed in mid-February at Techstars Startup Weekend Women in Denver and we were drawn together after hearing Amelia pitch her idea to create a breast health app. From Friday night until Sunday afternoon, we researched breast health trends, identified market gaps, tested our product ideas with women, and finally came up with a solution to build an all-inclusive breast health app with a connected breast self exam reminder device. On Sunday afternoon, nine teams from the event pitched their company ideas to five judges and Norma was the unanimous winner. As Denver’s Startup Weekend’s winning team, we won a trip to Paris to compete in a Global Startup Weekend Women pitch event on Mar. 7, 2018. Over the course of the next three weeks, we worked hard to build out our business model, better understand women’s breast health needs, and launch a basic breast self exam journal app before the competition. Of the 22 teams from 15 countries that participated, Norma took home third place! While in Paris, we learned that we had been accepted to participate in the University of Colorado’s New Venture Challenge (NVC) in March. The three-week competition wrapped up on April 4 and we took home three awards: Women’s Entrepreneurship Prize, 3rd Place in the IT track finals, and audience choice award. Not only that, of the 117 teams that participated in the competition, we were awarded the third highest amount of prize money, which is invaluable as we bootstrap Norma and work hard and fast to bring her to life. Needless to say, the past seven weeks have been a whirlwind, yet we wouldn’t have wanted it any other way. Not only are we a majority-student team, but four of us have personal family experience with breast cancer and we all know we are working on a problem much greater than ourselves. Something really special and unique happened that cold, snowy weekend in February that’s left a team of six women on a mission to help women around the world take control of their breast health and learn their ‘normal’ so they can detect something that’s not. WN: Take us through how the app currently works. What upgrades do you have planned for the future? LD: We launched a basic breast self exam journal app in early March as a way to test our concept and understand how women use the app. Over the course of the next few months, we will expand the journal’s functionality, as well as build out new features to include adding a breast health resource section, a community connect tab, and an ability to share data and journal entries with a doctor. In the future, we’d like to incorporate telemedicine so that no matter where a woman might be, or whether she has health insurance or not, she can always connect with a medical professional if she has breast health concerns. As we build out our app, we will also be building an app-enabled Internet of Things (IoT) device that signals a woman to perform her exam. In our interviews with hundreds of women, we learned that the biggest reason they don’t perform exams is because they forget. We know an app notification doesn’t always spur action and that’s why we are building this simple piece of hardware to help women form a lifelong habit of monthly breast self exams. Further, we are determined to have Norma be an all-inclusive breast health resource. While breast cancer and other breast health issues primarily impact women, men and the LGBTQIA community are affected by breast issues, too. Additionally, when someone receives news they have breast cancer, they aren’t the only ones touched by the diagnosis. It’s our hope that Norma also becomes the go-to resource for minority groups battling the disease, as well as for the countless friends and family members supporting loved ones battling breast cancer. WN: What is your marketing strategy? LD: Our goal is to launch a fully-functional app and begin taking IoT device pre-orders in October 2018, which is Breast Cancer Awareness month. October is six months away and we don’t want to wait until then to start helping women change their breast health habits. That’s why we launched the Norma Network of Breast Friends on Apr. 1! Each month on the first, Team Norma and our Breast Friend brand advocates text the women in our lives a reminder to perform her breast self exam and to #feelitonthefirst. Through this grassroots campaign, our goal is to get women to start taking a proactive approach to their health, while also building brand recognition and loyalty. We love the work our Breast Friends do to instill healthy habits and will be featuring them on our blog and inviting them to test our app and IoT device before we launch. WN: What are your goals for the year ahead, and how can the grant money help you reach them? LD: The next six months are a sprint for Norma as we build, test and iterate (and repeat!) our products with the goal of launching in October. It’s certainly ambitious, but we have proven our ability to work together to achieve milestones and we’re confident we can meet the October deadline we’ve set for ourselves. It’s pretty rare to have as large of a co-founding team as ours, but the amazing thing about it is that we have nearly all the tech and business skills required to bring Norma from idea to reality. With help from WomensNet, we are able to start reaching out to manufacturers to build our IoT device prototype and to better understand mass quantity production costs. We anticipate raising a seed round starting in mid-May, but with this Qualification Grant, we can address the business needs now that all companies face when starting out. Thank you, WomensNet, for your help in making Norma come alive! WN: Share some advice you would give to an aspiring female entrepreneur. LD: Show up, put yourself out there, and find a team to support you in your journey. There are going to be highs and lows and you need a solid network around to get you through trying times. If you ever have doubts, think about the regret you would feel if you didn’t take a chance on yourself or your idea and just keep driving forward. You can do it and there are so many women ready and willing to assist you!